Get Gift Certificates for Skiing and Riding! Gift giving made easy. Buy your friends, family or loved ones the gift of skiing and riding and enjoy the experience of watching their smile unfold. Buying a gift certificate for skiing and riding is as easy and 1.2.3. Simply purchase online, and the email confirmation is sent to you or the person you are buying the gift certificate for. $25 worth of lift tickets, equipment rentals or lessons. $50 worth of lift tickets, equipment rentals or lessons. $100 worth of lift tickets, equipment rentals or lessons. $150 worth of lift tickets, equipment rentals or lessons. $200 worth of lift tickets, equipment rentals or lessons. $250 worth of lift tickets, equipment rentals or lessons. $500 worth of lift tickets, equipment rentals or lessons. $1000 worth of lift tickets, equipment rentals or lessons. 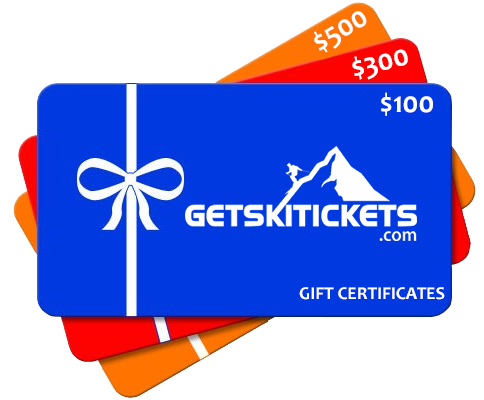 Gift cards must be redeemed either through GetSkiTickets.com or through our call center. Purchases are deducted from the Gift Card balance. If an order exceeds the amount of the Gift Card, the balance must be paid with a credit card or other available payment method. Gift Cards cannot be returned, reloaded, resold, transferred for value, redeemed for cash or applied to any other account, except to the extent required by law. We are not responsible if a Gift Card is lost, stolen, destroyed or used without your permission.